It’s easy to work anywhere with just a laptop and an internet connection. However, when it comes time to receive mail or book a meeting, now you have a problem. How do you keep from being tied down to an office while still enjoying all the perks of having an office? With a virtual office. A virtual office allows you to rent the address of your ideal building, either only using it as a mailbox or also taking advantage of the other functions it offers. Here are a few ways they’re the on-the-go worker’s dream: 1. Keep The Professionalism, Lose the Ball and Chain Even with working remotely becoming the ultimate dream of both the daring entrepreneur and the bored office worker, there is still a stigma against those who decide to make their couch their office over an official board room. Professionalism is the key to having success, especially as a fledgling startup, so you can’t afford to look cheap or amateur when your business is on the line. A virtual office allows you to have the best of both, keeping your professionalism while breaking free from the chains of an office. - Enhance Your Website. It’s impossible to have a flourishing business in the modern age without a snappy website, and undoubtedly one of the key signs of success is an official office address. While it may seem minor, having those few lines of text at the bottom of your site is an indicator of how serious and how professional you really are. By having a virtual address, you can flaunt it on your website and gain the additional points as a reputable business. - Have the Look. First impressions are everything, and if you were given a choice between a suburban home with an un-manicured lawn or a prestigious office building to do business with, which would you trust? Even with all the support startups receive, it’s still people’s money on the line and they will choose a place that looks successful, professional, and trustworthy over the alternative. A virtual address allows you to have a high-quality office building as your first introduction, without being tied to the place itself. 2. Save Money Most startups end up going out of business, no matter their niche, in the first two years. It’s almost always is because of a lack of funds. In order to weather your early storms, it’s important to minimize costs wherever you can. Virtual offices offer you all the assets you need without the cumbersome price. - Virtual Offices Are Less Expensive. Virtual offices come with a range of options, where you can choose simply a mailbox or also cash in on a receptionist or private boardroom. Even if you choose all the fancy options, it’s obvious that the price will be significantly lower than if you purchased the desk space, the utilities, and all the equipment needed to go with it. Because of this, you can have all the perks of a real office without the price tag to sink your startup’s ship. - Enjoy Breaks on Shipping Costs. Several shipping companies offer businesses a different break on costs than they do the average person, meaning that having a virtual address to receive your mail through can give you significant savings. Not only does this keep your personal mailbox from filling up, especially if you have to buy cumbersome equipment, but it also saves you money in the long-run. 3. Have the Convenience Tell just about anyone that you work from home and they’ll cheer you on and call you a lucky dog, but when you’re hosting a conference call and your kids get into a play-fight that sounds like someone’s getting murdered, suddenly the encouragement fades. Working from home or on the go is incredibly convenient, but this can also bite you. A virtual office allows you to have your freedom without the downsides. - Receive Mail There. When buying equipment on a frequent basis, or receiving materials from clients or manufacturers, your personal mailbox can become quickly overwhelmed. As an added problem, when your spouse ends up mixing an invoice up with junk mail and tossing it away, you could find yourself in hot financial water. A virtual office allows you to clearly separate business from personal affairs, while also serving as a professional-looking return address on anything you mail to clients. - Arrange Meetings Within the Office. While during personal hours your client may love cats, they may not appreciate Fluffy sitting in their lap during professional hours. Some virtual offices allow you to not only claim the address in pen, but also in practice for meetings. You can rent the room to match your address, allowing you to separate personal time from professional time, while also making a better impression. - Have a Receptionist. Some virtual offices offer more than just mail; you can even go as far as having your own receptionist manage calls. If you feel the need to cut down on costs, you can have an automated machine, or if you’re looking to make an impression, you can have a real person available. - Choose What You Want, Not What You Can Afford. First impressions are everything, and no one can doubt that a nice office in the ritzy side of town will make a better impression than an older, grimier one in the unpleasant side of town. 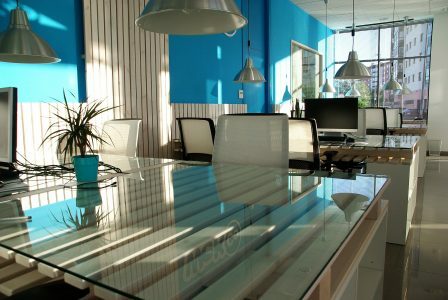 However, these places are ritzy for a reason and you as a startup may not have the funds to choose your dream-office. With virtual offices, you can enjoy a much smaller price, since you’re renting much less, and still have the address of your dream-office to impress investors, clients, and business partners. As an added bonus, there’s no need to live in the good side of town simply to work there; you can enjoy your remote work while also enjoying your fixed office. Remote work is more popular than ever, but some stigmas are still in place concerning offices. For convenience as well as a boost to your professionalism, choosing a virtual office is the key to having both at a better price.